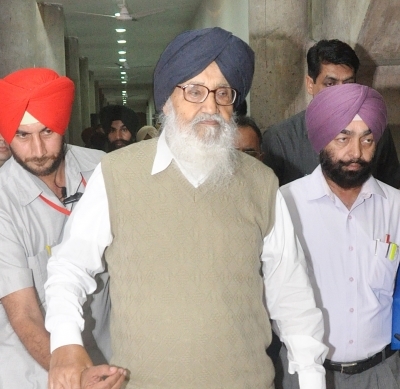 Chandigarh Sep 16 (IANS) Accusing the state s Congress government of encouraging radical elements former Punjab Chief Minister Parkash Singh Badal on Sunday claimed there was a plot to assassinate him and his son Sukhbir Badal. "I have been been informed by the police about a plot to assassinate me and my son. But we neither frighten others nor are going to be frightened by such reports or threats " Badal said at the Shiromani Akali Dal s Jabar Virodh Rally in Faridkot town nearly 230 km from here. "I am ready to sacrifice myself and my son Sukhbir (Shiromani Akali Dal chief) for the cause of peace and communal harmony in the state " Badal said. "The Khalsa Panth represents a history of sacrifices for upholding the values of peace communal harmony and Sarbat da bhala as enshrined in the teachings of Sikh Gurus " he said. The rally was held amid a standoff with the state s Congress government led by Chief Minister Amarinder Singh which had earlier refused permission for the SAD rally. The Punjab and Haryana High Court on Saturday allowed the SAD rally. A handful of radical elements protesting against sacrilege incidents reported during the previous SAD-BJP government (2007-2017) protested against the rally on Sunday. Tight security was in place at the rally venue to keep these elements away. Badal accused the Congress government of encouraging the radical elements and thus playing with fire to disturb peace in Punjab. "The Congress is in collusion with forces that put Punjab through a period of turmoil violence and bloodshed. It is the same old nexus between the Congress and some elements rejected by the Khalsa Panth who are now masquerading as panthic. They are up to their old games and conspiracies " the veteran Akali leader said. "The Congress objective is to fulfil its old dream of grabbing control of the Sikh shrines and historic religious institutions. The main target is the Shiromani Gurdwara Parbandhak Committee... that is why the Congress is using these so-called panthic outfits as their front men." He warned that all this could set Punjab on fire again and apealed to the people to be vigilant against being used as cannon fodder by "these elements who can get others children killed to promote their own petty selfish interests". Badal claimed that violence in Punjab is on Congress agenda since its government wants to divert people s attention from its failure to fulfil election promises and come up to public expectations. SAD President Sukhbir Singh Badal alleged that Chief Minister Amarinder Singh had stooped to new lows in political discourse by using derogatory words against his nonagenarian father. Amarinder Singh is a "completely unethical person" and that "everyone is acquainted with his past and character " the SAD chief claimed.